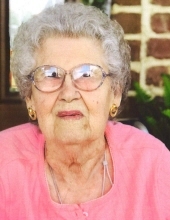 Marguerite Eleanor (Tankesley) Simonetti, 93, widow of John Simonetti, went home to be with Dad on Saturday, October 20, 2018 in Augusta Health in Fishersville. Mrs. Simonetti was born on May 25, 1925 in Staunton, a daughter of the late Luther and Annie (Andrews) Tankesley. She was a member of St. Francis of Assisi Catholic Church where she served on many committees. Prior to retirement, she worked for Canteen Corporation at Smith’s Transfer and spent many years with Dad at Rockys Gold and Silver in Weyers Cave. In addition to her parents and husband of sixty-four years, Mrs. Simonetti was preceded in death by two brothers, Luther Tankesley and Frank Tankesley. Surviving are her sons, Rocky Simonetti (Brenda), Ricky Simonetti (Ellen), Anthony “Tony” Simonetti (Tilly); a daughter, Tammy Arbogast (David); fourteen grandchildren; nineteen great-grandchildren; four great-great grandchildren; a special niece, Jeannie Brown (Arnold); special nephew, Frankie Tankesley (Gail); sister-in-law, Hazel Tankesley; also to cherish her memories are special friends, Judy Ruble, whom she loved dearly, Nancy Davis, Lucia Retrosi, and Linda Tracy. A Rosary Service will be held at 6:00 p.m. Tuesday, October 23, 2018 in Coffman Funeral Home and Crematory with visitation to follow until 9:00 p.m.
A Mass of Christian Burial will be conducted 10:00 a.m. Wednesday, October 24, 2018 in St. Francis of Assisi Catholic Church by Father Joseph Wamala. Active pallbearers will be Shawn Showalter, Stephen Simonetti, Christopher Simonetti, Scott Simonetti, Josh Santos, Will Santos, Brad Harris, Todd Harris, and Buddy Rittenhouse. Honorary pallbearers will be Frankie Tankesley, Bill Simonetti, John Tankesley, Joe Tankesley, and Arnold Brown. The family would like to thank Royal Care, Laura Woodridge, and Dr. Lagrua at Fort Defiance Carillion for the loving care given to Mom. In lieu of flowers, memorial contributions may be made to St. Jude Children’s Research Hospital, 501 St. Jude Place, Memphis, Tennessee 38105, a charity Mom always supported. To send flowers or a remembrance gift to the family of Marguerite Eleanor Simonetti, please visit our Tribute Store. Visitation to follow until 9:00 p.m.
"Email Address" would like to share the life celebration of Marguerite Eleanor Simonetti. Click on the "link" to go to share a favorite memory or leave a condolence message for the family.